Washington’s kid-glove treatment of Riyadh in the wake of events in the Saudi consulate in Turkey has shown allies they need not worry about criticism. If it’s an “America First” presidency, where does that rank human rights? 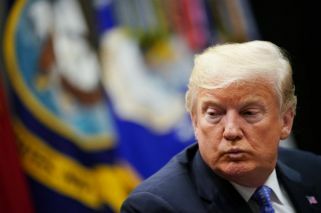 US President Donald Trump’s refusal to put public pressure on Saudi Arabia over the disappearance of journalist Jamal Khashoggi is raising a question that has dogged his foreign policy. In dealing with Russia, across Asia and, this week, in the Middle East, Trump has often appeared comfortable downplaying concerns about rights abuses and dismissing the importance of US moral leadership. The once realestate mogul is as likely to let financial or security interests guide his choices and his words. On Tuesday, Trump repeated the Saudi royals’ denials of any involvement in Khashoggi’s killing and suggested he trusted them. Not many US leaders would cast Saudi Arabia as innocent. Saudi Arabia is engaged in a bloody civil war in Yemen that has killed thousands of civilians and exacerbated a famine that has killed many more. Domestically, the absolute monarchy strictly regulates speech and dress, and its security services have been accused of torture. Trump has shown no interest in calling out the kingdom over Khashoggi — or calling out Russian President Vladimir Putin on assassinations or North Korea’s Kim Jong-un on political prisoners. Where past presidents in both parties used their office to promote US values and ideals — even when their action didn’t align — Trump has rarely seized the chance. Instead, he says what others would not. White House aides have suggested that while Trump is reluctant to criticise certain world leaders publicly — most notably when he did not upbraid Putin at their Helsinki summit — he has been willing to deliver tough messages behind closed doors. Still, Trump’s transactional approach isn’t sitting well with some of his Republican allies in Congress. Relations between the US and Saudi Arabia are complex. The two nations are entwined on energy, military, economic and intelligence issues. The Trump administration has aggressively courted the Saudis for support of its Middle East agenda to counter Iranian influence, fight extremism and try to forge peace between Israel and the Palestinians. One key for the US administration has been the bond between two young princes. Trump son-in-law Jared Kushner and Crown Prince Mohammed bin Salman are frequently in contact, and their relationship played a role in Riyadh being the unlikely first stop on the new US president’s maiden international trip in 2017. Trump, despite endorsing a travel ban on many Muslim-majority countries, became the first US president to make his official first trip to an Islamic nation.